I know, it doesn't look hopeful, does it? In fact the last thing I think of doing when looking out of the window at a scene like that is prance around semi-naked. But though bikini season seems like it's an age away, now is when we really have to think about it. Because now it's bikini-body building season. If you're planning on hitting the beaches this July, now is when you want to start putting effort into that bikini body, whether you need to shed a few pounds or just tone up. Few figures survive through the winter, after all, and by the time bathing suits start towering over you in shop windows, the idea of squeezing into them or, worse, bulging out of them, can be an extremely intimidating thought. So, the solution: get a head start. 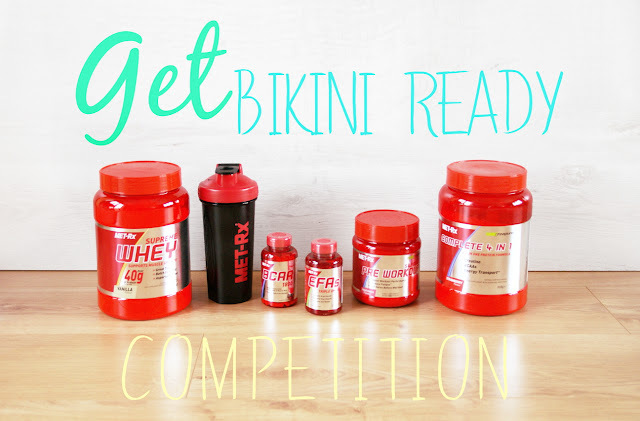 I've gathered some really useful advice and tips for shedding fat to get bikini-ready, or just to tone up to rock your swim suit, and I'm especially excited to offer an amazing competition from MET-Rx to supplement your work and help you reach your goals. In the two posts I've talked about the best and easiest way to lose fat in time for summer, including exercise structure, workouts, and eating - and it's not complicated - and also the best way to get an already slim body in perfect condition for the beach. But, perhaps you're not interested in beach holidays, perhaps you'd rather hit the slopes. I know I prefer being cold, it's easier to warm up than it is to cool down - there are only so many layers you can take off before someone calls the police - so I would rather ski than head to the beach. But even in that case, if you're not used to physical work, skiing isn't just a matter of standing on flat sticks and sliding down a hill. There's a lot of control involved in your core and your legs, and building your strength and endurance - with resistance and cardio, respectively - will help your body prepare, and that means you'll get more enjoyment out of the vacation. In which case, both articles will contain useful information. The giveaway is now closed. The winner has been selected, contacted, and has accepted their prize. Thanks so much to everyone who entered! Good luck with getting bikini-ready! Now for the giveaway! While whole food is the best place to start, supplements can really give your results a boost. A pre-workout drink with a good dose of caffine can help to give your energy a boost before you get started, unlocking more power for your workout and helping you achieve a few more reps or sets, and a tasty vanilla protein shake is great post-workout if you've not got anything else in the house. It's a quick dose of 40g protein in a sweet shake that can feel almost like a naughty indulgence if it's a flavour you love, and if you mix it up before your workout and keep it in the fridge, it gets the chance to thicken up a bit and you'll be grateful for the chill. MET-Rx have provided a MET-Rx Shaker bottle, MET-Rx lkg Complete 4 -In-1 strawberry shake, MET-Rx 510g fruit crush Supreme Pre Workout Powder, MET-Rx 1kg vanilla Supreme Whey shake, 60 triple Omega 3-6-9 soft gels and BCAA's for one lucky winner to help them get undeniably bikini-ready. The product bundle has been compiled to help give a pre-workout energy boost, help with post-workout recovery and improve lean muscle. Then there's the addition of Omega 3 which is one of the fats most people lack, as it's found mostly in nuts and fish, two foods that are more popularly disliked than their counterparts, such as fruit and chicken respectively. This fat is essential for your heart and your brain, and it's proven to aid weight-loss as by simply ensuring you're getting the nutrient will help your body function better, and a properly functioning body will respond better to exercise and the right food, allowing better nutrient absorption and cardiovascular and muscular activity (ie, being able to start and complete your cardio and resistance training with a little more ease). To enter, use the raffle copter widget below; open to residents of the EU only. Terms & Conditions: the giveaway is open to residents of Europe only, due to the cost and difficulty of shipping such big, heavy products outside of the EU. The competition runs from April 28th to May 13th and the winner will be contacted privately via the email address that will be linked to the entries (either email or facebook-registered email). The winner will have 72 hours from contact to respond and accept their prize. If the winner fails to respond within those 72 hours, they will be notified of failure to accept and a new winner will be chosen. This page will update when the winner has accepted their prize. The prizes were donated by MET-Rx and no payment has been received to host the giveaway. All words are my own, including the two linked articles. I started doing kettlebells last year and it's my favourite form of exercise. It challenges me both physically and mentally! I love dancing and walking. I'd love to do dance classes but don't get the time. Most of my exercising involves jogging, lots of walikng and swimming. I love dancing - it's a fun, energetic exercise.